A variety of gourmet cheese, meats and nuts. 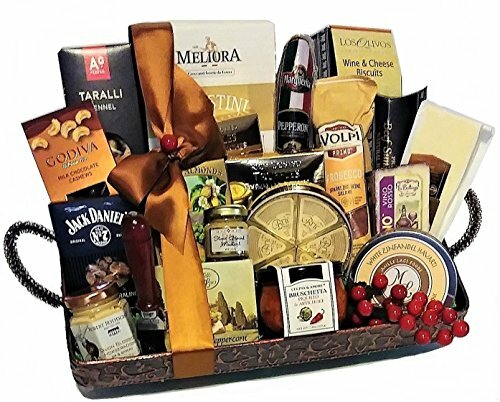 An outstanding delicious assortment of Gourmet Cheese including Gouda Cheese, Brie Cheese Wedges, Aged Cheddar, Fontina Peppercorn Cheese Spread, Havarti Cheese Spread, Dry Cured Salami, Pepperoni, Summer Sausage, Crostini Crackers, Cheese Biscuits. Jar of Bruschetta, Horseradish Onion Dip, Mustard, Cheese Spreader, Fine Selection of Nuts including Godiva Chocolate Cashews, Smoked Almonds, Pecans, and a taste of Belgian Truffles. Presented on a gorgeous 16" metal tray. Wrapped with clear cellophane, ribbon and your gift message card.